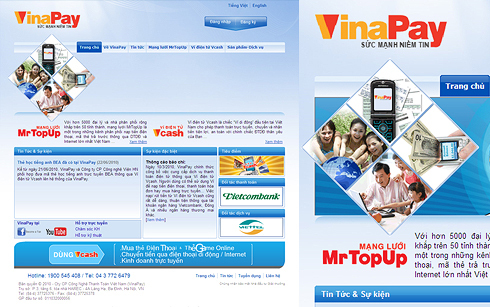 Established in 2006 by national and international investors, Vinapay is the first Vietnamese mobile top-up & payment platform, offering electronic transaction services to mobile operators, banks, retailers and end-users. Its MrTopUp service is one of the biggest prepaid card distributors in Vietnam, with over 5000 agents in 50 cities and provinces nationwide. In March 2010, VinaPay officially launched the Vcash E-wallet, an electronic payment service, allowing users to send and receive money anywhere, top up mobile accounts and game cards and much more. In 2007, Vinapay won a Red Herring 100 award as one of the best startup companies in Asia.